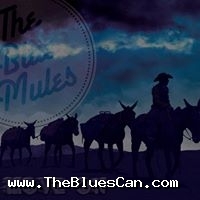 Description: Trent Schmiedge, singer and guitarist for the Blue Mules always envisioned having his own blues band. There were many forks in the road of the journey; however, with the perseverance of the band’s namesake, things came together just as they should. The Blue Mules are three guys who love to play music! If a genre had to be chosen it would be the “The Blues”, however, the band is so much more with foot stomping energy, a groove and searing guitar tone that cannot be denied. The band recorded their debut CD, “The Blues Ain’t that Bad”, at Fame Machine Studio. Earl Pereira, of the Steadies and former Wide Mouth Mason member, produced, mastered, mixed and tweaked growls, thumps and sweet tones for the Blue Mules. The album was released late summer of 2013 on Dynasty Records, with distribution through HMV and FYE stores across North America and digital distribution through CD Baby.